Good things do come in small packages! 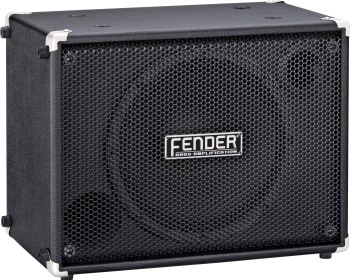 The new Fender® Rumble 112 Cabinet is a gigging bassist’s dream, capable of handling 500 watts, yet weighing in at a mere 24 pounds. So it’s not just easy on the ears-it’s easy on your vehicle, your venue and your vertebrae! The cabinet’s special lightweight design delivers more pronounced low-frequency response than most small cabs, and its 12" neodymium speaker gives you the best of both worlds, squarely between the knockout punch of a 10" speaker and the seismic boom of a 15" speaker. Combine these features with the switchable tweeter (full/off/-6db), and you just became a thundering force to be reckoned with, especially when you pair the Rumble 112 with the Rumble 2x8 Cabinet and a Rumble Head. Other great features include a side handle for easy portability and a unique magnetic system for holding a Rumble Head securely in place while delivering a serious amount of bass with no interference from vibration.